What's up in grandma's attic? Click here to play! Skeletons? Musty, old furniture? Or maybe it's full of treasure beyond belief? Do you dare enter Grandma's Attic to uncover the mysteries stored away in the damp darkness above? Open the creaking doors to reveal grandma's secrets. You might just find a few skeletons hidden up here, which is a good thing. These bones will bring in good money! Spin two to five of them across an active pay line and you'll get up to 7500 times your line bet! They also act as a wild symbol and will substitute for all other symbols to help you create more winning combinations. Not only that, but they also double prizes when they appear in a winning line. There are plenty of other surprises in Grandma's Attic that you'll want to collect. The crown will fetch up to 750 times your line bet. Or there's the old couch, rat or jeweled necklace. Don't forget the fruit! It might seem weird to see fruit in grandma's attic, but these will bring in plenty of cash if you spin them across a pay line. Grandma has a few hidden treasures such as the skeleton key. Spin three to five of these symbols and you'll open up a bonus round. There's also the armoire that no doubt contains some tantalizing treasures. Three to five of these will multiply your total bet up to 50 times. It will also trigger free spins. Venture up into Grandma's Attic to unlock her secrets and possibly a massive fortune! The mysterious amoire acts as a scatter. Spin three to five of these and you will multiply your total bet up to 50 times. It will also trigger 10 free spins in which prizes are tripled. The scary skeleton acts as a wild symbol. Spin two to five of these and you'll get up to 7500 times your bet. It will also substitute for most other symbols to help you create winning combinations. Prizes are doubled when the skelly appears in a winning combination. The skeleton key will trigger a bonus feature if you spin three to five of them anywhere on the board. 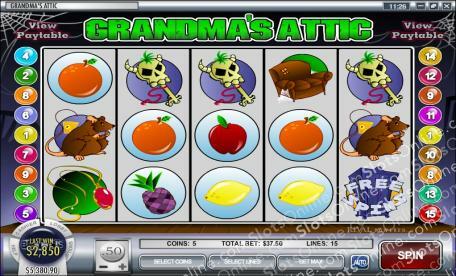 It will also multiply your total bet up to 50 times. During your bonus feature you will select from a selection of chests. If the key opens the chest, you will be rewarded the coins inside.